With a little help of Mother Nature, the summer events in Enschede start sunny on Kingsday, april 27. On that day the Dutch celebrate the monarchy and its probably the biggest countrywide party in Holland. King's Day is known for its "vrijmarkt" (Dutch for fleamarket) , where everybody is allowed to sell things in the streets. Beside that there is much music, gaming for childeren, performances and much lots of food en drinks. The night before kingsday is also very crowded when all bars and disco's are open and people get in the mood for the following day. Band playing at the the Oude Markt. A few days later, on may 5th, it is liberationday in the Netherlands. On this day the country celebrates the end of World War II with a lot of activities. Festivals, flea-markets, open-air performances, exhibitions... every the various organisations put together an anjoyable programm. 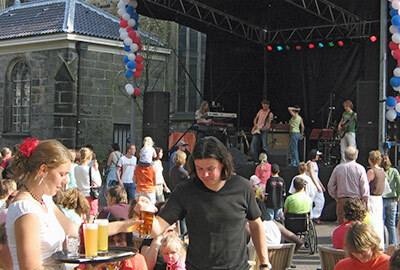 During july and august, every thurday there are parties on the Old Market square. Mostly build up around a theme such as Salsa, Blues, Reggae, Volksmusik or Dance. The Old Market is also famous for the many cafes around the church. Combined they make a large terrace where people meet for a drink of rest after a long shoppingday. 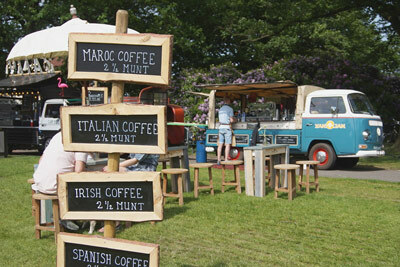 Foodfestival in the van Heekpark.